Creativity, humanity and whimsy seem to be abundant qualities among the sand sculptors producing unique works of art at various competitions across the United States this year. In June, the Hampton Beach Sand Sculpting Competition in New Hampshire celebrated its 17th anniversary by attracting more than a dozen professional artists, including at least five from Canada. This year’s winner at Hampton Beach was Mélineige Beauregard from Montreal, Quebec. 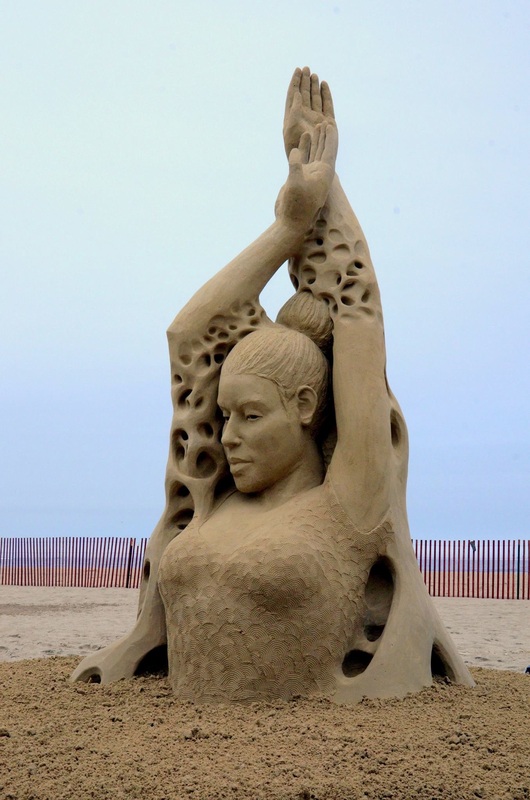 Her work in sand, titled “Dance of the Undefined,” shows a woman from the waist up with honeycomb arms stretched above her head. Mélineige explained that the piece represents how people are constantly changing in some ways while staying the same in others. She considers art as a kind of spiritual experience, according her to bio on the Hampton Beach website. Mélineige has won more than 30 individual awards in sand sculpting. In 2004, she teamed up with her father, renowned sculptor Guy Beauregard, to win the World Championship doubles competition. Last year, she was the winner at the Revere Beach International Sand Sculpting Festival in Massachusetts. See the article by Liz Vanderau in Boston University Today. A slideshow of the Hampton Beach sculptures was posted on YouTube by Ammoguy5. Winners were listed on the Hampton Beach website with photos on the Hampton Beach Facebook page. 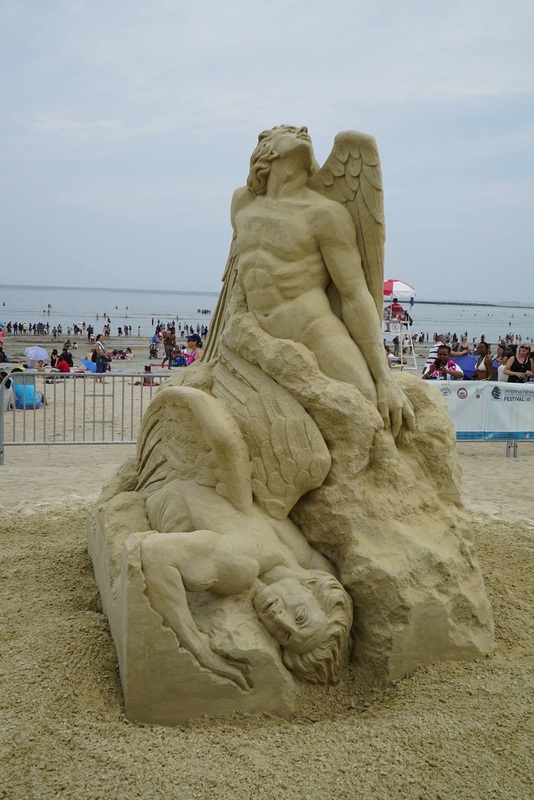 “Soul Evolution,” first place in the Revere Beach International Sand Sculpting Frestival. Artist: Pavel Mylnikov, Moscow, Russia. Another great sand-sculpting festival was held this year on July 14 and 15 at Imperial Beach, California. NBC 7, San Diego put together a nice video of the top winners. 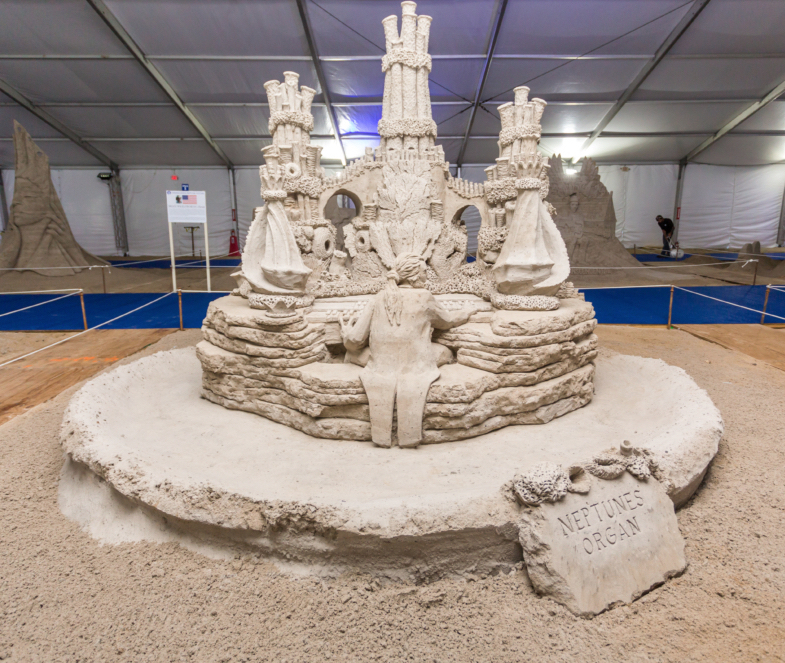 “Neptune’s Organ,” first place in the 2016 Virginia Beach International Sand Sculpting Championship. Artists: Meredith Corson Doubleday and Dan Doubleday, Florida. Still to come this year is the International Sand Sculpting Championship, Sept. 30 to Oct. 8 in Virginia Beach, Va. The event is part of the Virginia Beach Neptune Festival. More than 30 of the world’s top sculptors are scheduled to compete along with separate competitions for amateur sculptors. Last year’s first-place winner in Virginia Beach was Mélineige Beauregard, mentioned above. The first-place in team competition was won by Meredith Corson Doubleday and Dan Doubleday, mentioned above as artist-reporters in the Revere Beach competition. Their sculpture, Neptune’s Organ, also took the Neptune’s Choice, Sculptors’ Choice and People’s Choice awards in the team division. Winners from 2016 contest in Virgina Beach can be seen on the festival’s winners page. After enjoying dozens of photos showing amazing sculptures, I can’t help but think about the fragility and temporary nature of these artworks. For all their beauty and intricacy, as well as the thoughts and emotions they inspire, these sculptures soon disappear, and the artists are left to prepare for their next fleeting creation.